Roger Federer took another successful step in his highly-celebrated comeback on Wednesday at the Australian Open. The Swiss star prevailed past 20-year-old American Noah Rubin 7-5, 6-3, 7-6 (3) to reach the third round for the 18th consecutive year, every time Federer has played at Melbourne Park. The Swiss star hit 17 aces and won 82 per cent of his first-serve points. Federer had to work in the third set, though. He fell behind 2-5 against the American, who failed to convert two set point chances on Federer's serve in the eighth game. Federer faces a familiar foe in the third round: 10th seed Tomas Berdych, who beat American Ryan Harrison 6-3, 7-6 (6), 6-2 in just over two hours. Federer leads their ATP Head to Head rivalry 16-6. But the Swiss master said he would need to play better against big-hitting Berdych, despite winning their last five meetings, including a comfortable quarter-final victory at Melbourne Park last year. “He's caused difficulties for me in the past on faster courts: Cincinnati, New York, Wimbledon, Olympics in Athens. I know what he's got and I've got to lift my game a little bit,” said Federer, whose 17th seeding ensured a demanding path to the second week. 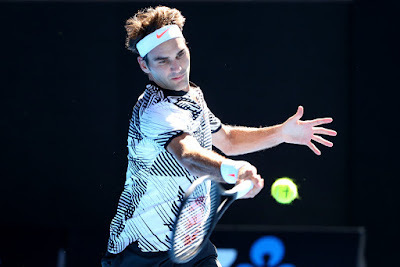 Coming back from a knee injury, Federer conceded before the tournament that he had no idea whether he was ready to withstand the long four and five-set matches of a grand slam. He was understandably thrilled to escape with only three sets before the Berdych battle. “If I could have signed a contract to be in the third round, feeling this way, weeks or days or a month ago, I would have taken it,” said Federer. “I'm still hoping to feel better and better and better as we go along.